An utterly simple and lovely dish. To make it with fillets of mullet instead of whole fish, cook the fruit with the oil and thyme for 10 minutes, then add eight good-sized fillets and the olives and spoon some of the fruit juices and olive oil over the top. Season and cook for another eight minutes. Season the mullet inside and out and stuff some of the thyme sprigs inside the fish. Put the fish in an ovenproof dish where they can lie in a single layer. 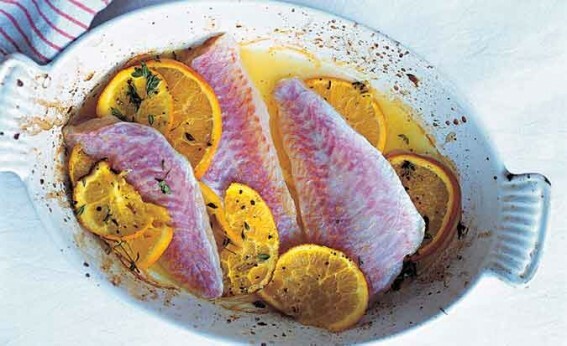 Mix the olive oil with the lemon juice and the juice of ½ of the orange and pour this all over the fish. Cut the rest of the orange into thin slices, halve these and tuck them around the fish with the rest of the thyme. Season and drizzle on a little more olive oil. Bake in an oven preheated to 180ºC/350ºF/gas mark 4 for 15 minutes. Add the black olives and put the fish back in the oven for another 10 minutes.